Malacañang on Friday for the first time invoked the 2016 ruling of the Permanent Court of Arbitration that invalidated China's historic claims over most of the South China Sea including the Philippines exclusive economic zone. President Rodrigo Duterte's spokesman Salvador Panelo made the remark after Chinese Foreign Ministry spokesman Lu Kang said that the Spratly Islands or Nansha, as the Chinese call them, were part of Chinese territory. "Buying time", as laid out in "Kobayashi Maru" scenario, was bound to be tested sooner than later. Only the geopolitically unaware would have thought that China would not respond, in one way or another, to Philippine attempts to buttress is position. While Philippine defense social media favors discussions about the acquisition of military hardware . 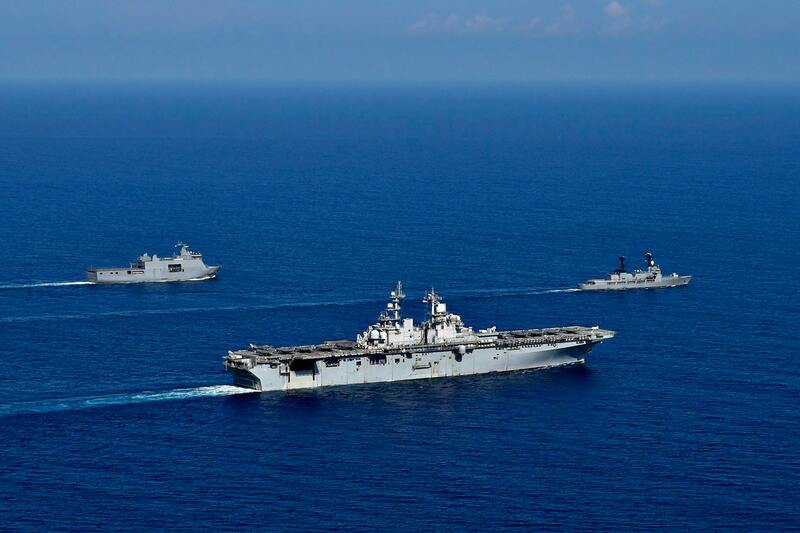 . .
USS WASP LHD 1 and the PHILIPPINE NAVY's BRP Tarlac (LD 601) and BRP Ramon Alcaraz (PS 16) steam together in the South China Sea during Exercise Balikatan, which wraps up this week after training to reinforce maritime security, territorial defense capabilities, and disaster response.
. . . the low hanging fruit for China would be to choke the Philippines economically. How far along are the Philippines' preparations for the inevitable 2nd PH-CN Banana (et. al.) War? “We have taken note of those remarks made by the Philippine officials. The Nansha Islands are within China’s territory, for which we have sufficient historical and legal basis. For thousands of years, Chinese fishermen have been fishing in these waters in the South China Sea. Their rights should not be challenged,” Chinese Foreign Ministry Spokesman Lu Kang said during a press conference in Beijing on Thursday.